They are loyal and loving and always there for you; there is a reason that people often refer to pets as their best friends. The loss of a pet is devastating, particularly when you have to spend the holidays without them being present with your family. 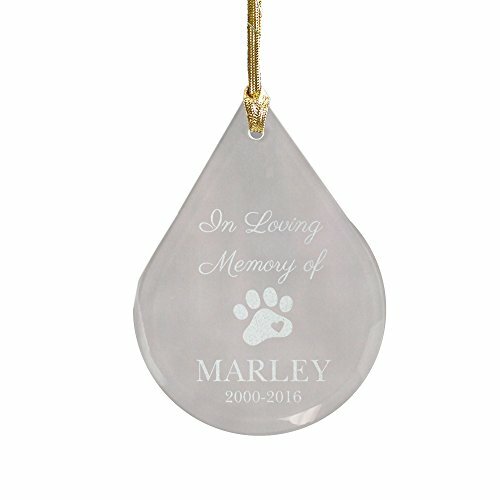 Our beautiful pet memorial ornament is a lovely piece that you can hang on your Christmas tree to honor their memory. This beautiful teardrop ornament measures 3 3/4" x 2 5/8" x 1/8" and includes a golden ribbon loop that makes it easy to hang from any Christmas tree or ornament stand. There is also a gift pouch included so you can give this decoration as a present for anyone mourning the loss of a pet. This glass piece is laser etched with the words: "In Loving Memory Of". We will also engrave this piece for you with any name and memorial dates at no additional charge. To create this memorable keepsake, just simply enter any name and memorial years and we will do the rest. While your dog or cat may be gone, ensure that they are never forgotten with this beautiful ornament that will make your home shine for years to come. Etched with the words: "In Loving Memory Of"
Measures 3 3/4" x 2 5/8" x 1/8"